Download version does not require a DVD drive. Classy rally action for the Mac - over 300 different competitions! Take on the world in 9 stunning locations and 100+ thrilling events across the globe. 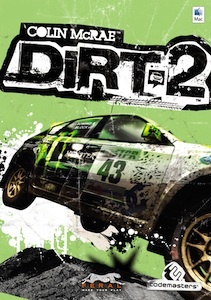 DiRT 2 combines eye-popping extreme motor sports with classic rally events in a wheel-spinning, nerve-jangling package that's the most fun you can have on four wheels and a Mac. Master up to eight different racing disciplines in a rich mix of arcade-style and simulation that combine to create a challenging, but always accessible experience. From London's iconic Battersea Power Station to the Malaysian Jungle and the Utah Desert, racers are immersed in beautifully realised environments each with their own distinctive driving terrains.